have been extended: 8:35-3:23 pm! April 23rd, 2019 Lunch Change! Contact the office at 608-789-7000! Wed. April 17th: Burrachos Night Fundraiser! April 18th-22nd: No School Spring Break. Return April 23rd. 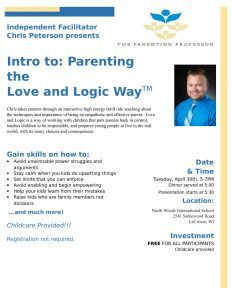 Tues. April 30th: Love and Logic Way Event (5:00 dinner, 5:30 presentation) See below for details! 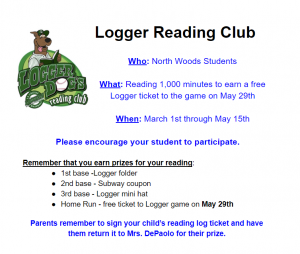 Loggers Reading Club! March 1st-May 15th! See below for details. Trinity Lutheran Church (1010 Sill St) is the host location for the From the Heart Food Pantry and Monday night meals. The From the Heart Food Pantry is open on Mondays from 5:30-7pm. Monday Night Meals are served from 5-6:00pm. Both of these events/programs are open to the public! Great News! North Woods Exceeds Expectations! North Woods International School is a Candidate School* for the Primary Years Programme. This school is pursuing authorization as an IB World School. These are schools that share a common philosophy—a commitment to high quality, challenging, international education that North Woods International School believes is important for our students. *Only schools authorized by the IB Organization can offer any of its four academic programmes: the Primary Years Programme (PYP), the Middle Years Programme (MYP), the Diploma Programme, or the Career-related Programme (CP). Candidate status gives no guarantee that authorization will be granted. For further information about the IB and its programmes, visit http://www.ibo.org. Click here for about the IB Program! 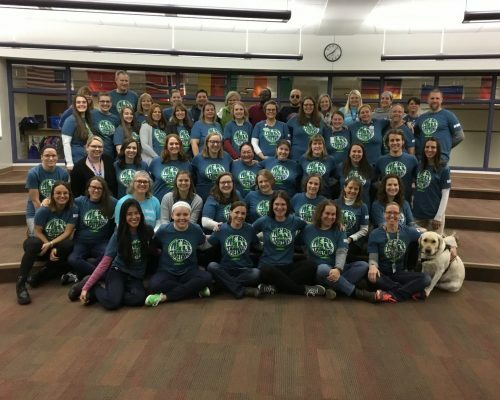 Meet the 2018-2019 North Woods International team!